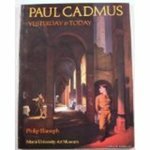 Eliasoph, P., "Paul Cadmus, yesterday & today" / essay and catalogue by Philip Eliasoph ; with a foreword by Lloyd Goodrich. Oxford, Ohio : Miami University Art Museum, 1981. Eliasoph, Philip, "Paul Cadmus, yesterday & today" (1981). Visual & Performing Arts Faculty Book and Media Gallery. 13.